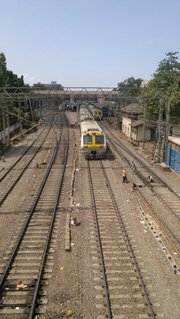 If you have recently shifted to Mumbai I am pretty sure you will not be fond of the Mumbai local. Well slowly gradually if you will get accustomed to it. You can love it or hate it but cant ignore it, So gradually you will get used to it. If you are not a frequent traveler buy a Coupon booklet. The booklet is valid for 6 months or so and you don't have to stand in long queue. If you are a daily traveler, god help you but then go for a pass. Travel light and keep a small sized bag. If you can manage without a bag then even better. If you have a bag then put your wallet or mobile in it. The train might be very crowded and pickpockets are most active at that time. Don't stand near the doors. Also don't talk on phone when your near the doors, even though train is moving as there are many sick minded people standing on poles with a stick. They will hit your hand and your phone will be gone. This is really sad, plus many people have fell of train when they were hit and have died. If you are need some information or help just kindly ask people will help you. You should know well in advance which side you have to get down. Many a times if you are standing on the wrong side you will not be able to get off. If you thought boarding the train was a task, Well surprise surprise getting of the train is a bigger task . Don't be the first one to get down as people are in real hurry. People start getting of the train before it stops. So if you are the first one in the line you will have to do the same. If you get a seat well consider yourself lucky. If you don't then stand on aisle near the seats that helps you avoid the pulling and pushing near the foot-board. In short try the non busiest part of the train to stand. I am a frequent traveller in western.. Peak time! The list is short & to the point imdeed. But as we know for new comers no list, no advice, nor any secrets can make travelling in local a good experience! haha that is true! Thank you Buddy!